Contributors. Preface. 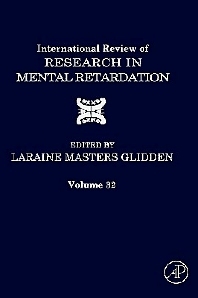 Self-Determination and Mental Retardation, M.L. Wehmeyer. International Quality of Life: Current Conceptual, Measurement, and Implementation Issues, K.D. Keith. Measuring Quality of Life and Quality of Services through Personal Outcome Measures: Implications for Public Policy, J. Gardner, D.T. Carran, and S. Nudler. Credulity and Gullibility in People with Developmental Disorders: A Framework for Future Research, S. Greenspan, G. Loughlin, and R.S. Black. Criminal Victimization of Persons with Mental Retardation: The Influence of Interpersonal Competence on Risk, T. Nettelbeck and C. Wilson. The Parent with Mental Retardation, S. Holburn, T. Perkins, and P. Vietze. Psychiatric Disorders in Adults with Mental Retardation, S. Moss. Development and Evaluation of Innovative Residential Services for People with Severe Intellectual Disability and Serious Challenging Behavior, J. Mansell, P. McGill, and E. Emerson. The Mysterious Myth of Attention Deficits and Other Defect Stories: Contemporary Issues in the Developmental Approach to Mental Retardation, J.A. Burack, D.W. Evans, C. Klaiman, and G. Iarocci. Guiding Visual Attention in Individuals with Mental Retardation, R.W. Serna and M.T. Carlin. Index. Researchers and graduate students in psychology and sociology.